10 June, 2011 - Jorge Christian Amaro, the cocktail barman at Santa Eulalia’s Guarana, rose to the top of the field in Ibiza and became the first ever Hierbas Ibicencas Cocktail King, defeating eight other competitors at Nagai Restaurant. Alban Charles of the Monkey Bar came in second place, while Km5’s Andrei Harcha earned third and Pedro Garcia of Zest Mixology and Savannah Beach Club came in fourth in this most coveted of Ibiza events. Amaro, who has been tending bars for five years, outdid his competition with his conceptual cocktail ‘The Bibicenco’. Made from Baileys, crème de coco, banana and, of course, Hierbas, the concoction was very cleverly finished off with a tarragon-encrusted sugared rim, along with a daring syringe filled with a spicy syrup made from chilli, ginger and beetroot. The combination of the smooth, sweet drink and the hot spicy syrup was simply a marriage made in heaven, and cleverly represented the sweet and tranquil side of Ibiza as well as her hot and spicy edge, both working together in harmony. Amaro showcased his talents to a panel of judges that included Vaughan of Monkey Bar and Funky Room fame, My Guide Ibiza’s content editor and former chef Chantal Azevedo, and White Ibiza’s food blogger Mark E. Watkins, a personal chef and caterer on Ibiza. During his 15-minute presentation, Amaro wowed the judges with his clear explanation of the ingredients being used, while the finished product was unique and delicious. With his win, Amaro earned a complimentary week’s rental of a Burton, provided by Ducks United, an afternoon on the Rinker Bowrider speed boat, a gourmet dinner for two at Nagai, and a day of adventure courtesy of the Paintball Lounge Party. Charles’ second place cocktail paired Hierbas with vodka, cava and rose pearls, impressing the judges’ palettes with its complexity and inventiveness of flavours. To reward Charles, Boats Ibiza donated an afternoon on the Rinker Bowrider speed boat, complete with wakeboarding, waterskiing, snorkelling and all drinks, and Nagai again sponsored a romantic dinner for two. Rounding-out the field was Harcha’s third place summery cocktail which combined Hierbas with passion fruit, fresh orange and lime juices, as well as mint and sugar, while Garcia’s delicious blend of kiwi and basil, coupled with some expert flair bartending skills to wow the crowds, earned fourth place. For his efforts, Harcha also won an afternoon on the Rinker Bowrider speed boat and a case of Mari Mayans, while Garcia went home with a gift bag. 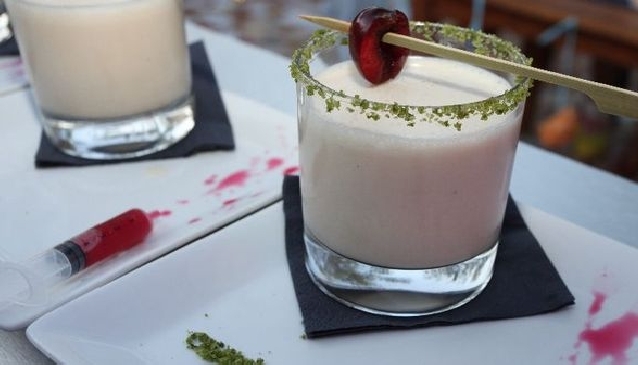 The event was held at Nagai restaurant on Ibiza’s San Juan road, and was supported not only by Boats Ibiza and Ducks United, but famed Hierbas Ibicencas manufacturer La Familia Mari Mayans, Envy Events, The Paintball Lounge Party and Zest Mixology.